On October 11, 1977, a Fairchild C-123 cargo aircraft was passing over central Massachusetts when the left engine caught fire. There were three crewmen aboard: the pilot, Major Gale French, the co-pilot, Captain Richard Gavin, and crewman Staff Sergeant Gary Miller. 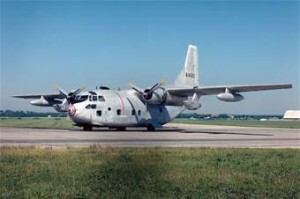 While Miller attempted to fight the fire, the aircraft was cleared for an emergency landing at Westover Air Force Base. As the plane was rapidly descending, Miller lost contact with the cockpit, and bailed out. He landed safely on a farm in Granby, Massachusetts, where he was picked up by a passing motorist and driven to Westover. Meanwhile, the aircraft crash-landed nose down on the runway at Westover, and skidded for 3,000 feet before coming to rest. All three men were transported to medical facilities for observation. A firefighter was also hospitalized for smoke inhalation. The crew were members of the 731st Tactical Airlift Squadron. Source: Springfield Union, “Four Injured In Flaming Westover Plane”, October 1977.